Thomas Mauriello (2nd from right) participating in a lunchtime panel discussion at the environmental law conference. 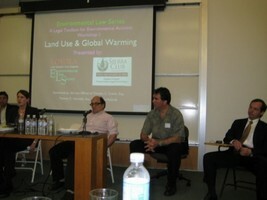 Thomas Mauriello helped organize and also spoke at the March 22, 2008 “Environmental Law Series” conference sponsored by the Sierra Club Angeles Chapter Legal Conservation Committee, of which Mr. Mauriello is a member, and the Loyola Law School Environmental Law Society. The conference focused on legal aspects of land use and global warming issues and was designed primarily for environmental activists and other non-lawyers.